Before you make a purchase, let Kinnek do the difficult part. Submit a free request for quotes using the form to the right, and we'll get multiple suppliers to provide you their commercial cookware offerings and pricing. This way, you can compare all your options in one place! Cookware is essential equipment in every commercial kitchen. Whether you’re making a sauce or a stew, searing chicken or stir frying noodles, choosing the right cookware will make a significant difference in the quality and efficiency of your kitchen. There are a multitude of options available to you, however, so be sure to take into consideration the various advantages and disadvantages of each before moving forward with your purchases. The most popular choice for standard cookware, stainless steel is durable, nonreactive, and easy to clean and maintain, though they tend to be somewhat more expensive and may suffer from uneven heat conduction if not well-designed. Thick, dense, and heavy, cast iron is a material frequently used in the construction of skillets and woks. The excellent conductivity of the material helps maintain high heat, and many chefs favor cast iron for searing meats. Do keep in mind that without proper seasoning of ingredients, acidic and alkaline foods can react with the iron and result in flavor and coloration issues. Also, be aware that cast iron rusts easily, and must be properly cleaned and maintained for maximum effectiveness. Copper is an excellent heat conductor, heating fast and evenly, and owing to its visual flair, is popular for cookware that will be consumer-facing -- at buffet chef stations and the like. The main disadvantage of copper cookware is its cost, as it is very expensive and is not particularly durable (it can easily warp). After years of avoiding aluminum for perceived health risks, kitchens have begun to use aluminum cookware once again. It’s quite popular, and for good reason: aluminum is an excellent heat conductor, and aluminum cookware tends to be light, durable, and cheap. Woks are deeply curved with the dipped bottom absorbing highly concentrated heat. The harsh curve helps with moving food around the pan and into the center portion where the heat is concentrated. Depending on the wok, you may have to purchase a separate wok ring to put onto your burner in order to fit the dipped bottom of the wok. This is the standard, most popular pan available. Fry pans have sloped sides, though the curve is not as harsh as a wok, and do little to concentrate heat. Instead, the slope helps movement around the pan, eases sliding of the cooked food out of the pan and into serving plates or containers, and helps to prevent steam from forming. Fry pans are versatile and can be used for searing, sauteing, scrambling, and more. Saute pans are also commonly seen in commercial kitchens, and though versatile like fry pans, they serve different purposes. Saute pans are designed to contain heat and spread it evenly -- the straight, medium-height sides of the saute pan contain the heat, and the wide bottom portion of the pan spreads the burner heat evenly -- which makes them well-suited for sauteing, searing, braising, poaching, deglazing, and more. 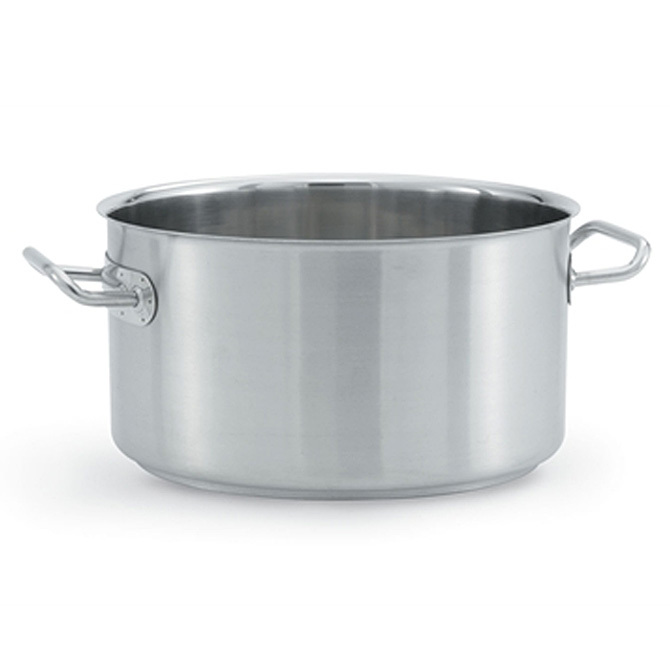 Stock pots are designed to efficiently handle stocks, stews, soups, gumbos, pastas, and essentially, any food that needs to simmer in liquid for a long time. The thick metal base of the stock pot means that it heats slower, but its capacity to absorb heat is high, allowing for a slow, effective heat transfer. This, in addition to the relatively small diameter of the pot and the high sides, slows liquid evaporation while maintaining high heat, so the liquid is preserved for longer and is able to infuse the solid ingredients with more flavor. Like stock pots, sauce pots are best used for handling slow cooking menu items such as stocks, stews, soups, gumbos, casseroles, and roasts -- but unlike stock pots, sauce pots are meant to reduce the liquid content as it cooks. The wider bottom and high-but-lower-than-stock-pot sides makes it easier for liquid to evaporate out, but there is a balance struck where the liquid is still able to transfer flavor to the solid ingredients. Sauce pans can be used not just for simmering sauces, but also for blanching vegetables, cooking grains and cereals, and melting butters. They come in numerous varieties: tapered, straight-sided, and others, each with their own advantages and disadvantages. Sauce pans share medium-height sides, though they vary in many other ways. As a general rule, any sauce pan with a narrower base will absorb less heat, making for a better simmer if you are not interested in evaporating the liquid out. Sauce pans with wider bases will conduct more heat, resulting in increased evaporation of liquids. Flared sauce pans make it easier to stir, and some sauce pans come layered with multiple metals (aluminum and copper, for example) in the sides to improve heat conduction. Speak with your supplier to learn more about this varied cookware. Grill pans have become quite popular in smaller kitchens who do not have an existing grill setup but still want to expand their offerings to include grilled meats and vegetables. Grill pans are most commonly cast iron for better heat retention, and have raised ridges that create the grill marks. If you are concerned about reactivity with regard to seasoning, look for enameled interiors. Dutch ovens are designed for slow simmering meats and vegetables in liquid without scorching, such as in casseroles, stews, soups, and roasts. They have just enough height that the meats and vegetables can be fully submerged in liquid. They are thick, and frequently cast iron, though it is not unusual to find ceramic and clay dutch ovens. The thick walls promote heat absorption and result in high, even heat conduction throughout the material.